UoP Library Web - How do I access the physical library? Main Access to the University Library is via Cambridge Road. Users displaying their blue badge disabled parking permit can park in the metered zones surrounding the library all day without charge, or on double yellow lines for a maximum of three hours. Students and staff who hold a valid disabled parking permit issued by the university may also use any university car park. The closest to the library is Ravelin Park. 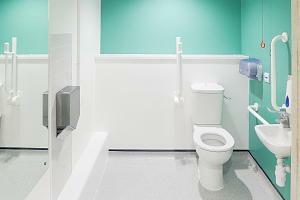 Accessible toilets are located on every floor. Those on the ground floor require a RADAR key. If you do not have a RADAR key for this please ask at the reception desk. The facilities on the first and second floors do not require RADAR keys. The first floor facilities are not accessible for those in very large wheelchairs or mobility scooters due to the surrounding shelving. There are two lifts giving access to the first and second floors. The lifts must not be used when the fire alarm is sounded. It is helpful if readers with mobility or hearing problems advise a member of staff at the reception desk when entering or leaving the Library. Appropriate measures can then be taken to ensure safety in the event of an emergency. The disabled refuge points are marked on our Library maps, which are available from all help desks. If due to either a short or long term problem with physical access to the library, or working in the library environment, you feel you cannot make full use of the library service please email library@port.ac.uk or telephone 023 9284 3228, and our staff will work with you to find the best solution.